Here’s a simple recipe that you can serve with just about everything! Really…these Ranch Potato Wedges are a great side dish with any meat (steak, chicken, hamburgers, meatballs, fish…). They are a perfect thing to make to go with your lunch…they are a super easy side dish to make with dinner. Good grief…you could even scramble up some eggs with them and serve them at breakfast or brunch. 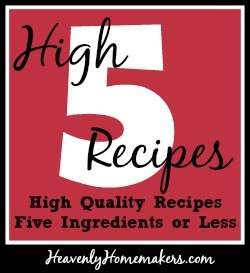 Like many of the High Five Recipes…this recipe takes just a few minutes to prepare. 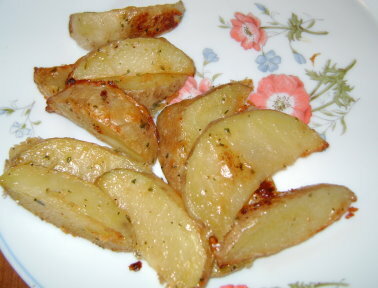 Scrub potatoes and slice into eight wedges each. Stir together mayonnaise and ranch dip mix in a large bowl. Toss potato wedges in mixture until coated. Lay wedges singularly on a cookie sheet. Bake at 400 degrees for 35-40 minutes. I am SO hungry now for a meatball with Ranch Potato Wedges! What do you think…could you serve these with just about anything? What would you serve them with? The next High Five Recipe I’ll share is the promised Peanut Butter Honey Fudge! Okay, i just have to say that i am having the most fun time reading your blog!! I am rather new to your blog (though i have borrowed a few of your recipes in the past). But for the first time today i actually took some time to read various entries that you have from whenever… you are hilarious! What a nice thing to sit down and have a good laugh. I love finding other women who are doing what i am endevering to do and having fun while doing it. Your blog is such an encouragement as i seek to make Jesus the center of our home for myself, my husband and our 4 children. thanks and God’s richest blessings on you and yours! How can I “like”? I am in almost the same position. I am a relative newcomer to your blog, but finding reading your recipes such a hoot! And the things you try, encourage me to try more. I am more of a baking person by nature – my husband does most of the “cooking”. But he’s willing to try some of these recipes, and I am going to get my grandma’s potato ricer in the next couple months, to try the tater tots. I’m excited! I have yet to meet a fellow who doesn’t like a simple meat and potatoes meal! Looks great. I am going to see if I can ge t them on the menu this week. We love these. We make them with a homemade ranch seasoning mix that the kids mix up for me. Then we just need to measure out a tablespoon or so. They are delicious. I never thought about breakfast, but you are right. Theyr really would work with eggs. Thank you – we may have them tonight with pizza! These look great. And so easy! Thanks! I’ve subscribed to your feeds….glad to have found you! These sound awesome! I’ll give it a try. My family is addicted to potato’s! We eat them all the time. They would love these….with everything. I’m going to be making them this weekend with Grilled Chicken. I would love to try Ranch Potato Wedges but we don’t have Ranch Dip Miix in Australia. Is it possible I could make up my own? Those look yumm-O!!! I’d serve them with lots of things, but this week they will round out our Friday baked fish meal. I made these for lunch to go with our salmon patties and they were yummy!!! Way better than McD’s fries!!!!!! Thanks for sharing an AWESOME recipe!!! Can’t wait to try these. We are raising four boys too (and three girls). New recipes are always a blessing!! You are a true kindred spirit, Laura. May the Lord richly bless you as you continue to seek and to serve Him. Do you order your ranch mix from Azure? Since I’ve been avoiding mixes like the plague, I forget that there are good ones out there that can make some really nice short cuts for cooking. Thanks for sharing this recipe. I’m so glad to have this recipe…I was just looking for a ranch potato recipe this week! Hi – I just tried these tonight and I think I did something wrong! When I put the 1 T mayo with the dip mix (@ 2T) it became a lump and was not easily mixed with the spuds! I ended up melting my mixture a little and this aided in the spreading. I enjoyed the flavor and would love to make them again – so can you tell me what I should do differently next time??? Thanks for you help! I had the same problem! I just made these this past weekend. Did you get an answer? Strange…sorry this didn’t work for you! Maybe add just a little more mayo next time? 1 Tbsp of mix and 3 Tbsps of Mayo? You know what… try rubbing them on the potatoes with your hands. This is how I did it and they were perfect! Mary’s suggestion on rubbing the mix on the potatoes. Thanks! Can’t wait to see how they turn out :). These sound awesome. Would be great with cubed steak or a Crock-Pot roast. Yum! Thanks for sharing such a simple and yummy recipe. Will give them a try soon. We’re having it with burgers tonight. Yummy! Are these soft or soggy-ish? Or are they pretty firm? I’d say overall they are a little more soggyish than crispy. I would serve them (and will serve them) with our fried tacos. My Grandmother made fried tacos and french fries once a week, and now I make our with ground venison and fried in coconut oil. I think the ranch potatoes will go perfectly. Question: If you make ahead and freeze these, do you freeze the wedges with the seasoning on or put the seasoning on the potatoes after you pull them out of the freezer? I’ve never tried freezing them. I think I’d freeze with the seasoning on. I just tried these and served them up with homemade chicken nuggets (basically the same as the country fried steak strips but with chicken). Soooooo yummy! I am new to cooking real food, and have somehow lived all my life on processed pretend food. This stuff is soooo great! (and a little secret…I am losing weight like crazy, just by using real foods instead of garbage!) Thanks so much! YAY!! That is so exciting to hear! Have you tried these with your homemade ranch seasoning mix instead of the packet mix? I was wondering how that would work with the minced onion in it. Just wondering. These sound great – thanks! YES and it works wonderfully!!! Thanks for asking – I need to go edit this post to include this information!! I forgot about it! I just made these tonight and they were DELICIOUS! All 5 of my kids loved them and even my husband said he loved them!! (he’s been a bit of a skeptic to all this ‘new’ kind of food that i’ve been making) Thanks for sharing!! I made these. I liked them and my mom liked them. My kids didn’t, but they are picky and I don’t think they really gave it a try. Thanks so much for the recipe. just made these and my husband said “Winner”!! thanks! Hi Laura! I tried this recipe out this evening and they turned out wonderful! My husband loved them! Thank you for the recipe! Made these last night . . . they were great! These definitely would be so delicious on grilled chicken salads with your homemade ranch dressing!! I wanted to report an exciting discovery about this recipe. It works BEAUTIFULLY with a head of cauliflower!!!! As we grew no potatoes this summer, but tons of cauliflower, I was urged to get creative with the cauliflower because apparently my family doesn’t like to eat steamed cauliflower most nights of the week. (What??!!) Shocking, I know. I kept the recipe the exact same, just in place of potatoes, used a washed and cut up head of cauliflower…….beautiful AND so good! Have never had any leftovers yet! Thank you for your website. It is awesome. I am mother of 10 and they love the Ranch potatoes. I served them with homemade Salisbury Beef patties. Keep up the good work. Will visit your website often. I’m going to make up Ranch dressing Mix sometime this week, so I can make these Ranch potato wedges to go with my homemade Turkey Sloppy Jo’s. It sound really good! My Children are Ranchers on a lot of stuff.